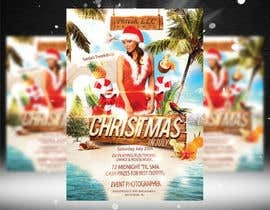 Contest for a bar/nightclub flyer for a Christmas themed club event during the summer. Size 4.25 x 5.5 inches. See image of several nightclub flyers below for inspiration. Incorporate a girl dressed in a Christmas hat, red skirt and and club top. Incorporate a northpole / candy cane like sign with the words "Santa's Twerkshop"
Please see design #37, Thank You. Please Check #23 - a sweet cocktail of summer, winter and christmas themes.